Next on The Scoop: Strange Obsessions? My Cats Have Them. How About Yours? 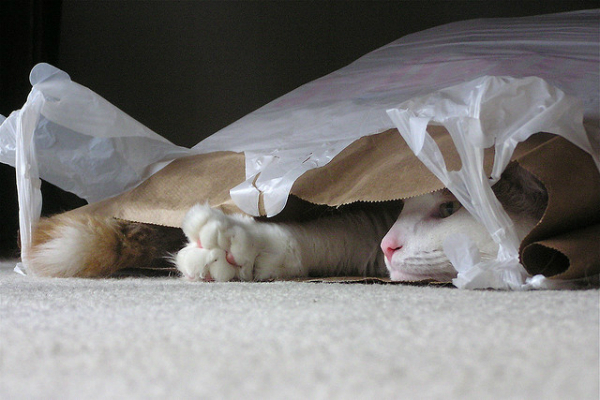 The feline obsession with all things plastic isn't all fun and games -- it can be dangerous. I learned years ago that if there’s one thing I should never leave out, it’s plastic shopping bags. In my case, it’s just because the sound of my cats licking that crinkly material was enough to drive me batty. But for one of my friends, keeping plastic out of her cats’ mouths is a matter of life and death: One of her beloved furry friends actually ate enough of a plastic bag to result in a midnight trip to the emergency vet and surgery to remove the stuff from his stomach. 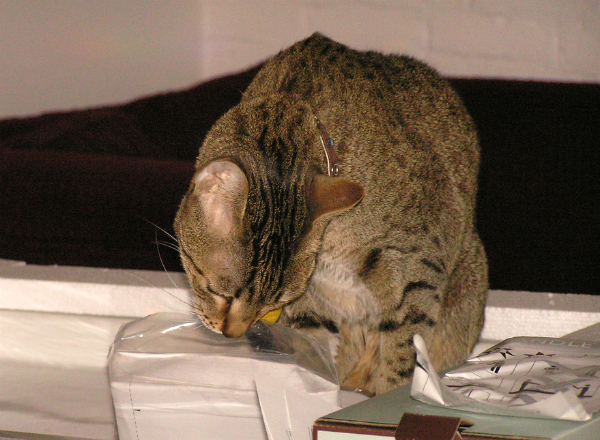 One of my cats also had an odd obsession with licking the emulsion off photographs. Soft plastics are porous and they trap the odor of whatever was contained within them. Cats’ sense of smell is even stronger than dogs’, and since we put everything from meat to fish to sandwiches in plastic, it makes sense that even the faintest whiff of a tempting treat could lead to licking and perhaps even swallowing plastic. A shopping bag makes all kinds of cool noises, which in some way mimic the sounds of little rodents scurrying around in the grass and leaves. More and more plastic shopping bags are being made of biodegradable materials that contain corn starch. Some cats seem to find the smell and taste of corn starch attractive. Plastics are treated with stearates, which are derived from tallow. I’ve seen some sources that say lanolin (the oil that makes sheep coats feel greasy) is also used in the production of plastic. Either of these things could be tempting to a curious carnivore. Gelatin is also used in photo emulsion, so that may explain the bizarre allure of those old Kodak moments. Some experts think that the smooth texture of plastic feels good on a cat’s tongue. There’s some thinking that the temperature of the plastic may be a factor, too, but in my experience, plastic pretty quickly picks up the ambient temperature of the room it’s in. Some plastics contain chemicals that may mimic pheromones or other attractants, and it’s possible that licking plastic could be an extension of the flehmen reaction (a behavior in which an animal curls back his upper lips, inhales, and often holds this position for several seconds). This could also explain why some cats like to urinate on plastic bags. 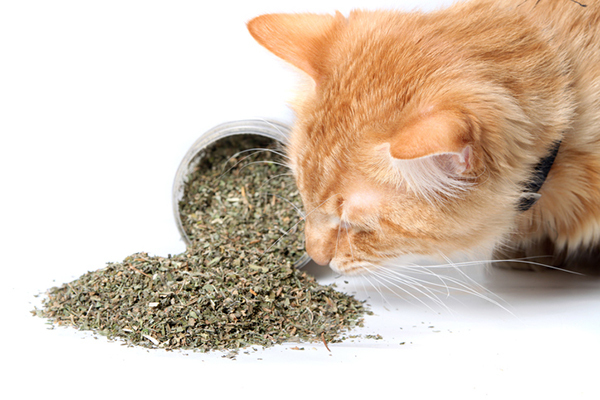 Some cats get in the habit of eating non-food items. 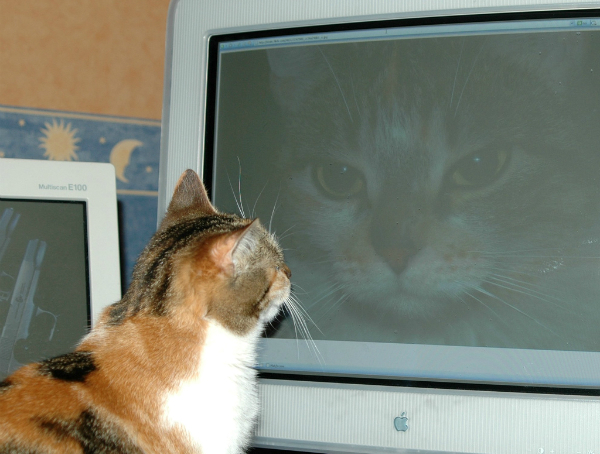 This condition, called pica, is sometimes considered a mental compulsion and sometimes thought of as an attempt to try and get necessary nutrients that aren’t present in the cat’s diet. What do you think? Do you have any other ideas about why cats are obsessed with plastic? 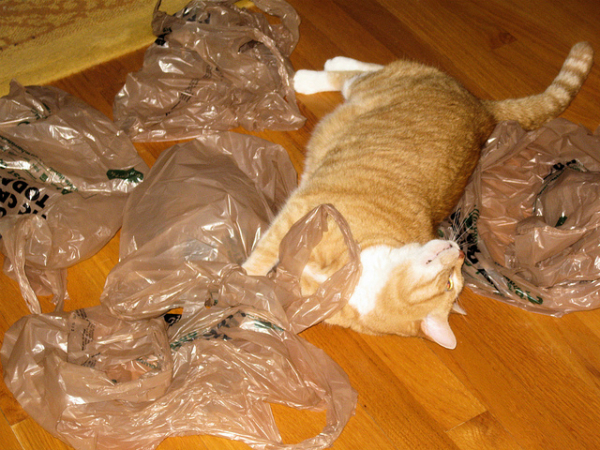 Do you have a plastic-crazed cat, and what plastics are his or her favorites? Sound off in the comments.